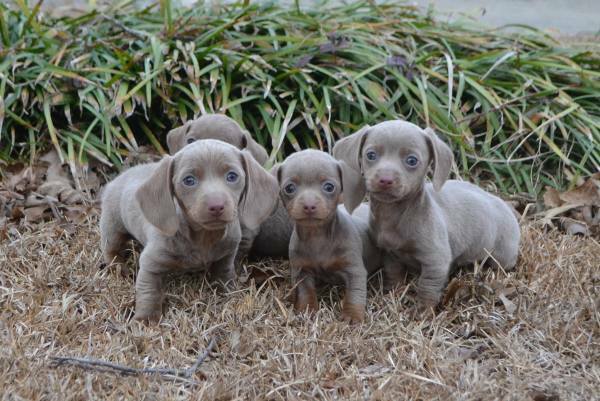 These sweet Dachshund Isabella puppies are from one of our previous litters. They are not for sale. We would like to thank you for considering one of our beautiful Dachshund puppies. We have miniature Dachshunds, Standard Dachshunds, and of course in between, "tweenie". All of our Dachshund puppies here at Down Home Dachshunds come with a One Year Written Health Guarantee and are current on all vaccinations and worming. They are raised indoors and are started on potty training as soon as they are "big" enough to go in and out the doggie door. They all play together, eat together and sleep with their littermates. We spend many hours every day with our Dachshund puppies to ensure that when our doxies arrive at their forever homes, they are happy and well adjusted. Each Dachshund Puppy will arrive with a puppy kit. It will include a sample of puppy food, a detailed health record, which will show the shots and worming they have had and will need in the future, information about NuVet vitamins, which they will have already been taking, and their AKC registration paperwork. All Dachshund puppies are sold with Pet Registration only. There will be an additional fee for full registration and breeding rights. Please let us know if you would like to breed your baby.For the well-being of our babies, we reserve the right to refuse to sell to anyone whom we feel is not a good fit for our puppies. Our Dachshund puppies are our "children", they are raised to be loved and become part of a family. They are not just a pet to us! We hope you enjoy your stay here at Down Home Dachshunds. For your convenience, we accept most Major Credit/Debit cards. A Non-Refundable Deposit of $200.00 is required to hold the puppy of your choice. The remaining balance is due before any puppy is to be picked up or shipped. These are our litters we have available at the moment. If you would like to see a video of a puppy you like, we can text one to you. Oreo and Tony Welcomed a litter on March 3, 2019. They are currently 7 weeks old and will be ready for their new homes on April 28, 2019. Betty and Marlon Welcomed a litter on March 2, 2019. They are currently 7 weeks old and will be ready for their new homes on April 27, 2019. Jewel and Brule' have a new litter! They were born on March 30, 2019. They are currently 3 weeks old and will be ready for their new homes on May 25,2019. If we don't have what you are looking for please email us and let us kmow what puppy you are wanting. We may have had another litter born and haven't listed it yet. We now have toys available for you new puppy! See more on our Products for sale page.